Constipation and abdominal pain can be fairly common when bowel movements are difficult and less frequent. Constipation is medically defined as fewer than three bowel movements per week. Less than one bowel movement per week is considered severe constipation. If your constipation and abdominal pain last longer than two weeks, you should see a medical professional immediately. Drink plenty of water- at least two to four glasses a day. Drink warm beverages, especially in the morning. Add fruits, vegetables, prunes, and bran cereal to your diet. Use a mild stool softener or laxative. You should consult with a healthcare provider if your constipation is accompanied by severe abdominal pain, rectal bleeding, cramps, nausea, or vomiting. These may be signs of serious medical condition. You should also seek immediate medical attention if your constipation came on suddenly (acute constipation) or for no discernable reason. If dietary and lifestyle changes don’t relieve your constipation, or if you have severe abdominal pain with your constipation, you should seek medical attention right away. 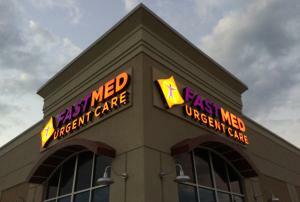 FastMed Urgent Care is ready for you when you need medical attention fast. Our locations offer extended weekday hours and are open on the weekends. Our state-of-the-art facilities are staffed with highly-qualified medical professionals and have the latest diagnostic equipment, so you can get the answers you need, typically in less than an hour.